JD Allen Music is a proud sponsor of stockcar racing legend Eric Duellman. In a race over the weekend, Duellman won - proving that a brand new car isn't required to succeed. "Not bad for a car that was built back in 1987! ", Duellman exclaimed in victory lane after a late race pass on the outside of then leader Paul Sweazey. Racing in the Elmer's Auto Salvage MTS Pure Stock division at Mississippi Thunder Speedway in Fountain City, WI. Duellman and his pit crew celebrated the victory by singing along with JD's new brand new hit single "Bangin' Doors". 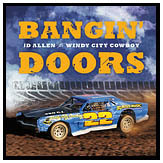 JD is back from the recording studio with his newest hit single: "Bangin' Doors" about dirt tracks and stock cars. In September, JD was featured as the Spotlight Artist on JSYRadio.com internet radio. You can listen to the entire interview below. With the overwhelming reception and success of the newly released album, "Heaven Is My Home", JD Allen is launching his spring series of local concerts. 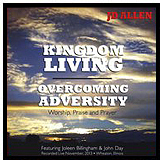 Joining JD are some of the same talented musicians who recorded with JD on the album, including the vocal talents of Joleen Billingham and guitar picker Jon Noffsinger. Backing the trio will be a full band including drums, bass, and harmonica. The music lineup includes songs from JD's recent album, as well as country favorites from his Windy City Cowboy selections. This is just the start of a full concert series around the Chicagoland area. Performing live at their annual Harvest Dinner held at the Barlett Golf Course, about 100 people from Village Church of Bartlett enjoyed an hour concert featuring JD Allen and Mark Granzow on guitar. The night was warm and personal, allowing JD to share with them music from his newest album, and sharing the inspiration for many of the songs featured. If you're ever passing through Nashville, make sure you swing through the little town of Joelton and look for BAR-B-QUE of Tennessee. Stop in and enjoy a long family tradition BBQ, chicken, and Ribs - and tell them JD sent you! They're located on the corner of Union Hill Road and Whites Creek Pike. To ensure you get a seat, call them at 615.299.1577.